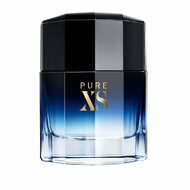 Pure XS, an untamed oriental, on-fire and fresh. An overflow of mouth-watering ginger sets the pace. Juicy. A rush of sap, sensual, vegetal. And potent thyme. Cinnamon races suave and stimulating around the lascivious note of Myrrh. Leather and vanilla sign the base. Skin is over-heating, it’s decadent, raw - and pure.